Hillary Clinton ran her 2008 and 2016 campaigns based upon spreading a myth that her nomination and election were inevitable, and nobody else could win. Despite the evidence in both 2008 and 2016 of how weak a candidate Clinton actually was, I still see frequent comments from Clinton supporters claiming Sanders cannot win because of lack of support from women and minorities. This was not actually true during the 2016 campaign, which Clinton might have never won if not for multiple ways the party rigged the system to help her win the nomination. A recent poll also shows it is not true today. 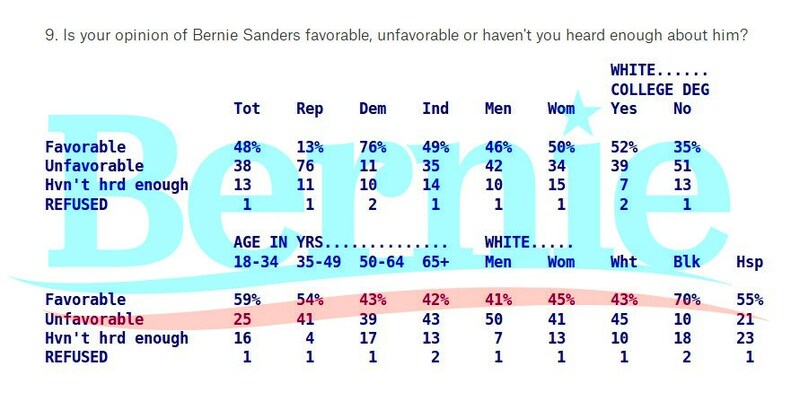 A Quinnipiac poll conducted last week showed that Bernie Sanders was viewed favorably by 50 percent of women polled, exceeding his support from 46 percent of men. He also was seen favorably by 70 percent of blacks and 55 percent of Hispanics polled. The concoction of the “Bernie Bro” narrative by pro-Clinton journalists has been a potent political tactic — and a journalistic disgrace. It’s intended to imply two equally false claims: (1) a refusal to march enthusiastically behind the Wall Street-enriched, multiple-war-advocating, despot-embracing Hillary Clinton is explainable not by ideology or political conviction, but largely if not exclusively by sexism: demonstrated by the fact that men, not women, support Sanders (his supporters are “bros”); and (2) Sanders supporters are uniquely abusive and misogynistic in their online behavior. Needless to say, a crucial tactical prong of this innuendo is that any attempt to refute it is itself proof of insensitivity to sexism if not sexism itself (as the accusatory reactions to this article will instantly illustrate). The sexism charge is especially absurd considering that a very large percentage of “Bernie Bros” supported Elizabeth Warren before Sanders entered the race and Warren announced she would nor run. Most of those who voted for Sanders in the primaries voted for Clinton, and many of those who did not voted for Jill Stein instead. Far more Clinton supporters in 2008 crossed over to vote for McCain/Palin in the general election, often because of having a woman on the Republican ticket, and sometimes due to racism. In the fantasy world of the David Brock/Peter Daou propaganda machine, if you supported Sanders your views are never taken seriously. Not only are you a sexist, they also believe you are likely to be a Russian bot. In one of the most absurd twists yet in the investigation into Russia-aligned election meddling, CNN reports that Kremlin-linked actors may have tried to use the hype around the augmented-reality app to inflame racial divisions. If you’re having trouble imagining how whimsical Japanese fantasy creatures might connect to deep-seated societal tensions, you’re in good company. The answer isn’t exactly intuitive. Apparently, the Internet Research Agency — the same notorious troll farm behind the election ads Facebook recently disclosed — ran a contest on Tumblr directing players to find Pokémon near sites of alleged police brutality against African Americans, and name them after the victims. Users were then supposed to email the organization proof of having done so for the chance to win Amazon gift cards. CNN was not able to find evidence of anyone actually following through with these instructions. 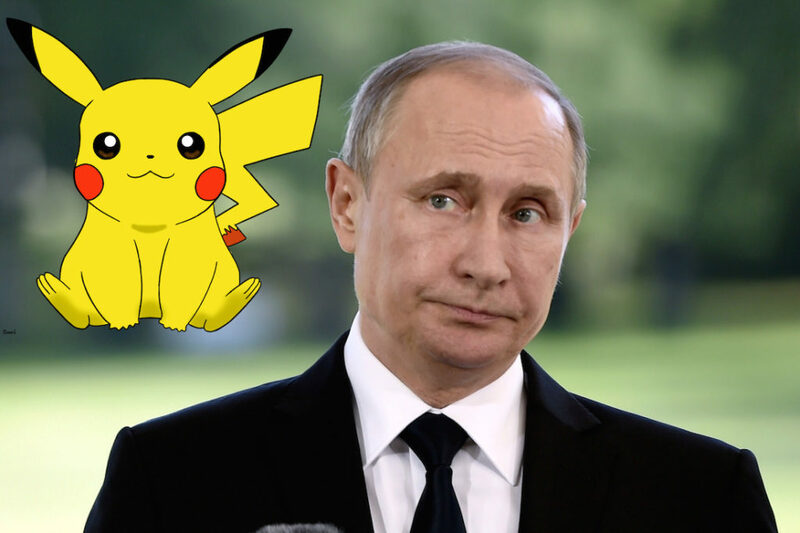 Meanwhile, there were reports last year that Putin was going to ban Pokémon Go because of alleged links to the CIA. Is the country packed with Russian propagandists? To Daou, opposing Clinton just might make you a Russian propagandists as he recently tweeted, “If you spread the idea that Hillary Clinton is a horrible monster, you were a de facto Russian propagandist.” Yes, if you consider Clinton a monster for all the unnecessary wars she has supported, or for her corruption, you are a de facto Russian propagandists. No disagreement with her views is possible other than being a Russian propagandist. …Videos published by Williams and Kalvin in late 2016, especially in October, often engaged in fever swamp theories about Hillary Clinton and in some cases promoting Donald Trump directly. Does everyone remember all those persuasive rap videos? Remember all those polls which showed that black voters voted for Trump instead of Clinton because of those videos from Williams and Kalvin? No. I don’t either. Nor is there any plausible explanation why Clinton’s favorability declined while Obama’s increased when they were attacking both if Williams and Kalvin were influential. 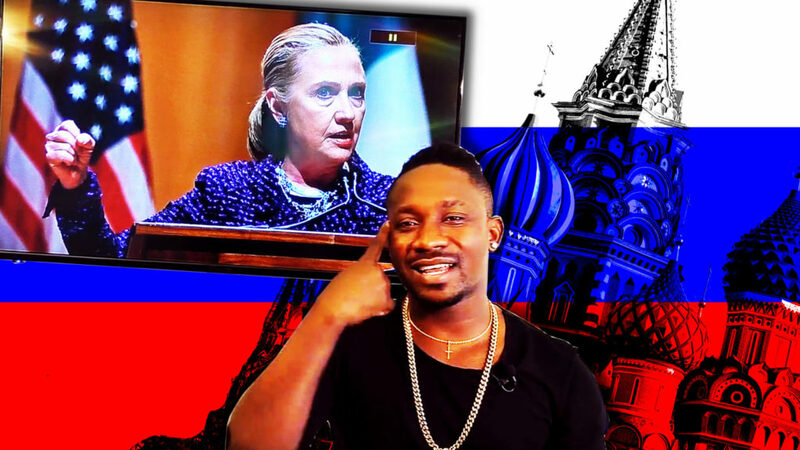 Attributing Clinton’s loss to the rap videos of Williams and Kalvin makes no more sense than to blame her loss on the $100,000 worth of Facebook ads allegedly purchased by Russia. On the other hand, if someone wants to argue that Williams and Kalvin were more effective in campaigning against Clinton than her most irrational supporters like Peter Daou were at campaigning for Clinton, I would be open to considering that argument. 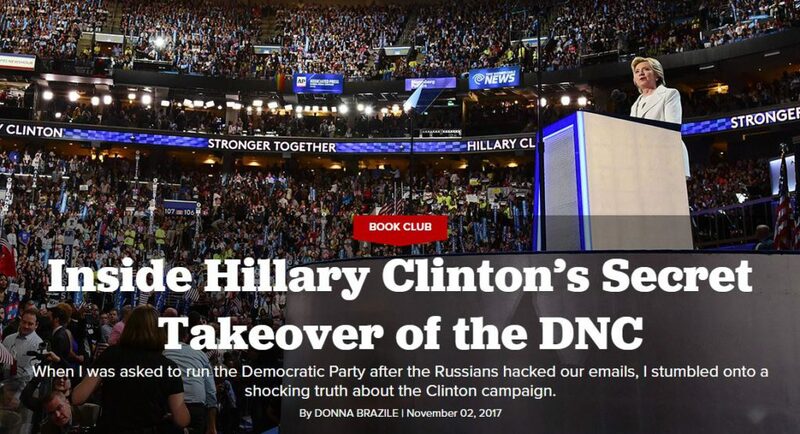 Clinton apologists and other pro-war Democrats are excited today by the report from the Daily Beast that Russians used Facebook to promote pro-Trump rallies in seventeen cities. Do they really believe that these rallies tipped the election results? These were trivial compared to the crowds turning out for official pro-Trump rallies. What hurt Clinton was not these allegedly Russian-organized rallies, but the fact that so few people had any interest to turn out to see her. The $100,000 which Russia is believed to have spent on influencing the election is trivial, especially when compared to the amounts spent by other groups. This is also trivial compared to the actions by the United States to influence the elections in other countries. Donald Trump refused to say that he’d respect the results of this election. That’s a direct threat to our democracy. The concentration by Clinton apologists on Russian spending on Facebook ads and trolls also raises the question as to why they were so much more effective than the ads and trolls (both paid and volunteer) used by the Clinton campaign. Facebook tends to create a number of echo chambers, but it is questionable how much impact it has on changing people’s minds. 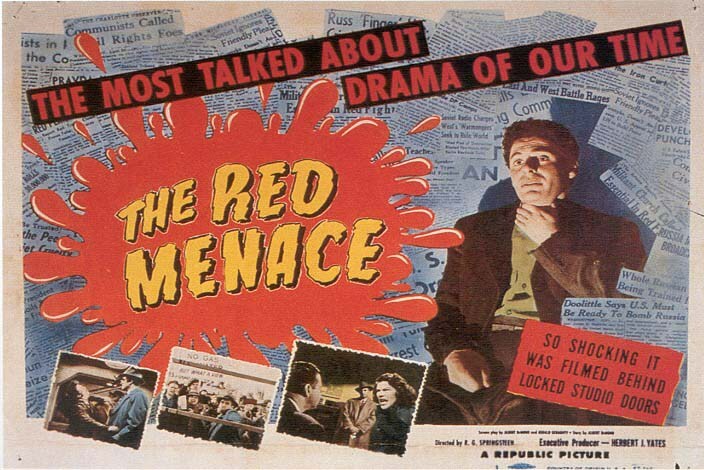 While the extent of Russian interference in the election remains under investigation, at this point there is zero evidence that Russia had any effect on the outcome. Peter Daou’s standard of one vote being affected is obviously absurd. Regardless of whether the evidence ultimately shows that Russia had an effect, there is no question that Clinton and her allies started making this claim with zero evidence in order to shift the blame for her loss. Unfortunately this has significance far beyond the fate of a failed presidential candidate. The greatest fear in seeing Clinton elected was that her election would lead to increased warfare, including a major deterioration in US-Russian relations. The Queen of Chaos threatens to bring this about even after losing. Hillary Clinton has become the Democrats worst nightmare. She managed to run a campaign which was so poorly run that she could not even beat a candidate as terrible as Donald Trump. Now her actions, and the actions of her most fanatic supporters like Peter Daou, threaten further damage to the party. 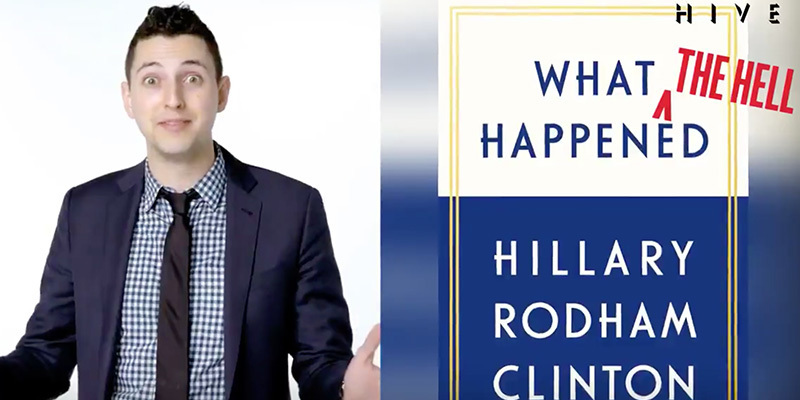 Politico writes, Democrats dread Hillary’s book tour: Reliving the 2016 nightmare is the last thing the party needs right now, many say. In a tweet late Tuesday night, Huffman pleaded with Clinton to stop blaming Sanders for her loss, as she partly does in the book, according to excerpts that leaked ahead of its release. Huffman said the tweet had gotten a lot of “likes” from his colleagues — albeit in private conversations with him. The Hill similarly reports, Clinton’s score-settling frustrates Democrats. Not everyone was so charitable. Even some of Clinton’s allies have grown weary of her insistence on re-litigating the 2016 campaign at a time when the Democratic Party is looking to forge a new identity in the age of Trump. …Those daunting challenges have some Democrats fuming at what they view as Clinton’s petty post-election score settling. My response to her attacks on Bernie Sanders were posted here. Besides attacking Bernie Sanders, Hillary Clinton has attacked Barack Obama, Joe Biden, and the DNC in post-election statements and in her book, further burning bridges with Democrats. Excerpts from Clinton’s book repeat the same type of bogus talking points we have heard, and dismissed, from Clinton supporters for months. It doesn’t help matters that the book is coming out at the same time that Peter Daou has started a Clinton propaganda site (Verrit.com) which has received a tremendous amount of mocking. (I have posted about it here and here). It is packed with talking points in the format of the graphic here, except I added my own message. Politico Magazine was even harder on Verrit in an article entitled This Pro-Hillary Website Looks Like North Korean Agitprop: Peter Daou, the prickly pro-Clinton operative, has launched a propaganda rag so shameless it would make Kim Jong Un blush. Who would buy stock in a twice-defeated presidential candidate? If the candidate under question is Hillary Clinton, that zealous buyer would be Peter Daou, one-time rocker, seasoned political blogger, former campaign adviser to John Kerry and Hillary Clinton, ambitious litigant, propagandist and internet entrepreneur. 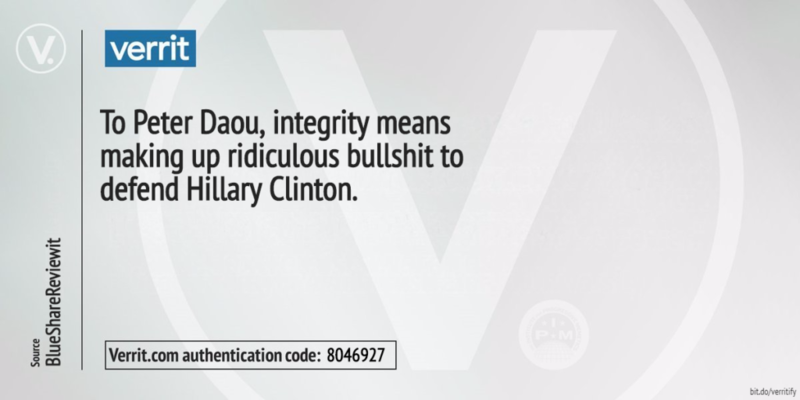 A couple of days ago, Daou launched his self-funded Verrit.com, a slavishly pro-Clinton site (endorsed by Hillary!) to carry on her failed crusade. 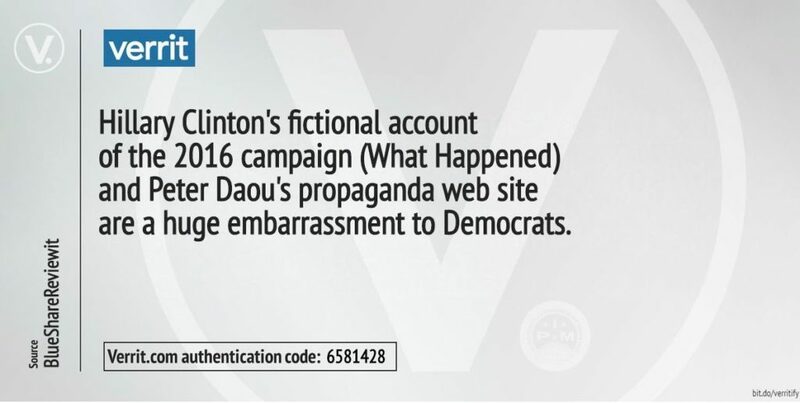 As Daou’s Verrit manifesto puts it, the site hopes to become the trusted source for the 65.8 million voters who cast their ballots last November for Clinton and who seek verified “facts” they can use to argue politics. In theory, everybody needs a cheat sheet. In practice, the Verrit method is cringe-worthy. The headline to one early Verrit borrows from the literary methods of Kim Jong Un’s North Korea to assert, “Hillary Democrats Are the Heart and Conscience of America.” Does anybody outside of the Daou re-education camp really think this way? When it comes to criticism, Daou isn’t just a snowflake. He’s a snow squall, equating most criticism of Clinton (or criticism of Daou) with the desire to erase Clinton and Clintonites. Early this year, he telegraphed his irrational partisanship by tweeting that anybody tweeting “Bernie would have won” in his timeline would earn “an instant block” from his account. “Useless and baseless conjecture. Betrays someone unfocused on the challenge ahead,” Daou continued. 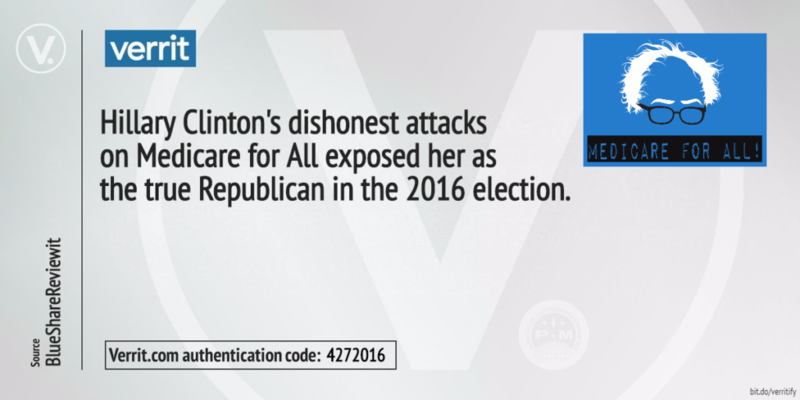 As the New Republic’s Sarah Jones pointed out, Verrit’s early shilling for Clinton easily veers into propaganda when it posts headlines like “Sanders and the Mainstream Media Helped Put Trump in the White House.” Such headlines present Clinton as a victim, denying her any agency, and blaming all of her failures on the press and Bernie Sanders. To dwell on this Verrit for just one more beat, is it safe to say that somebody out there is still terrified of Bernie, that somebody out there still wants to destroy Bernie, and that somebody wants to silence anyone who supported him. All of these attempts to cover up Clinton’s failures are not fooling the majority of Americans. As Politco also reports on the latest polls, Trump hits new low in public opinion — but he’s still beating Hillary Clinton. Just 36 percent of those reached by pollsters said they have either very or somewhat positive feelings about Trump, 2 points lower than in the poll’s June iteration. But at 36 percent, Trump still finished 6 points higher than Clinton, his 2016 Democratic opponent, about whom just 30 percent of respondents said they feel either very or somewhat positive. If Clinton had just stayed quiet after the election, she might have had a chance to avoid becoming even less liked than Donald Trump.